Cooking up a birthday bash? We'll tell you how to pull together the key ingredients. All you have to do is mix and serve. At home. Your baby will be comfortable and less clingy, and you won't have to worry too much about what he and his young guests are up to. If you're space-challenged, consider an afternoon open house - people will naturally rotate in and out. A coffee house or lounge during off hours. Bring in your adorable, well-napped baby to the coffee house first - during those quiet, off hours - and get the go ahead. Ask if you can bring in some baby snacks and even decorate one area. A grassy park or a playground. There will be plenty of room for everyone. Bring colorful tablecloths for the picnic tables, Mylar balloons to mark the area and blankets for the babies. A playgroup space. Don’t underestimate the fun and simplicity of a party in the space where your playgroup meets - this could be a group party for all the babies turning one during the month. In the morning. This is a great time for a playgroup party when babies are rested and happy. After the nap. Afternoons work better for a mixed-age party, especially if you're inviting your old slacker friends. The best setting is a place where your baby can be comfortable and you don't have to worry to much about what he and his young guests are up to. At home is ideal. Babies tend to be less clingy at home, which leaves you all free to have a good time. Plus, Baby can retreat back to his room if he needs some quiet time. If you're space-challenged, consider an afternoon open house; people will naturally rotate in and out. Be sure to account for the baby’s nap. If he's easy to put down and would sleep through a three-alarm fire, no worries. Otherwise, set a “black out period” in the visitor hours. An intimate gathering can be just as special as a big one, and much less stressful for everyone. Even a small family party – when combined with a cake, candle and a rousing chorus of “Happy Birthday” (don’t forget the photo) -- makes a wonderful, no-fuss celebration. If home’s not an option or you just don't want to have to clean up, be creative. A local coffee house or lounge could work during off hours. Bring in your adorable, well-napped baby to the coffee house first --- during those quiet, off hours -- and get the go ahead. Ask if you can bring in some baby snacks and even decorate one area. The management might want you to buy the cake from them – which is one less thing for you to worry about. (if you have a party theme in mind see if they can accommodate that). If the weather’s warm, a grassy park or a playground is a great setting. Bring colorful table cloths for the picnic tables (see decorations), mylar balloons to mark the area and a few blankets for the babies. Some finger foods, cake and beverages, and you’ve got yourself a party with plenty of room for everyone. Don’t underestimate the fun and simplicity of a playgroup party in the space where your playgroup meets - this could be a group party for all the babies turning one during the month. Lay out a blanket, sing some favorite kiddie songs, serve some cheerios and cut up banana, and then line all the half-pints on the couch for some adorable baby photo ops. When you're scheduling a party for a one-year-old, naptime is all-important. The after-nap party is the most successful. Mornings are great for playgroup parties; afternoons work better for a mixed-age party, especially if you're inviting your old slacker friends. 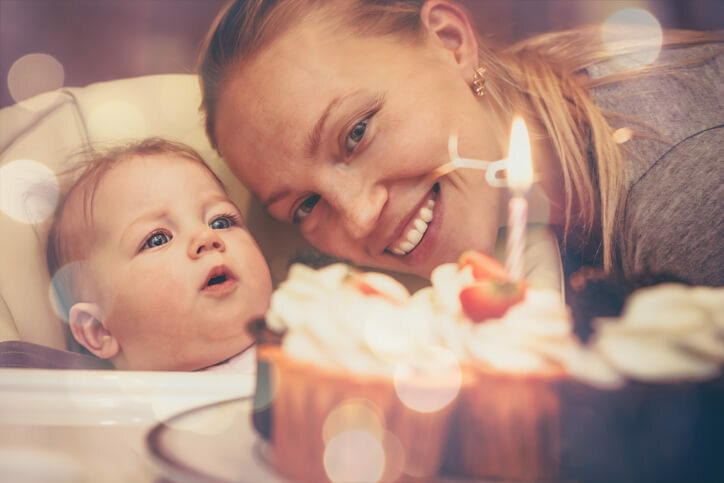 Some experts recommend that parties last no longer than one to one and a half hours, but if your baby is the easy-going type who's happy hanging out and will let you know when she wants some down time, up to three hours is doable. Bring together your pre- and post-baby worlds - old friends and family, along with new baby-group and park buddies. If you’re hankering for a big dose of old friends, make it an adult party and celebrate with the people you rarely get to see. That way, they all get a chance to play Auntie with your one-year-old. Finger foods, which are the great party equalizer: adults can eat with one hand while holding a baby and popping a couple of bites into a fast-paced toddler’s mouth; kids can nibble while clutching a stuffed animal; even the one-year-olds can partake. Opt for simple cheese and crackers, dips and pita or awesome pinwheel sandwiches made by slicing a wrap into thin sections. For the one-year-olds, put out some small fruit chunks and other finger foods. If you like to cook, focus on one dish that you can prepare ahead of time and leave to cook in the oven; baked ziti, lasagna or chili with a salad and fresh bread are practical solutions. A buffet with bagels, sushi or anything else that’s easy. Stock the baby buffet with Cheerios, cut up fruit and lightly steamed veggies like carrots, and organic baby cookies. Just dial up a pizza. Call it a potluck and you’re golden. This is a great way for willing friends and family to lighten your load; and if there will be older babies and kids at the party, you can be sure their finicky palates will be satisfied if Mom's bringing the food. Consider using an online potluck organizing tool. Everyone can post what they intend to contribute so you don't end up with ten lasagnes. The site also includes recipes for potluck dishes. A dessert and drinks party - this might be your last chance to celebrate like a grown-up! Combine some fresh fruit like strawberries with birthday cake and a Champagne toast. Baby is entertainment enough at most first birthday parties. You certainly don't need any costumed characters - they'd be more likely to scare the diapers off most tots than make them happy. For the babies, some music, perhaps an attempt at a sing-along (got a guitar?) or storytime with Grandpa (select a book in advance) can help to focus the event. If older kids will be there, you could try: For some physical fun, pick up a crawl-through tunnel at IKEA. A game of freeze dance; the babies will be intrigued! Older siblings or cousins will stay out of trouble if you put them in charge of stuff – like collecting coats and greeting guests. You could also let them create a talent show (baby entertainment). Decide ahead of time whether you want an avalanche of gifts or if you’d rather avoid gifts this year. If the latter, put a note in the invitation suggesting that people bring only books or donate to a charity of your choice instead. If you want your baby to get gifts, decide whether or not to send a list of suggestions to your invited guests. Will you open the gifts at the party (possible overload for Baby) or afterward (not as fun for your guests)? If later, you'll need to make sure that each package is clearly labeled, and you should factor in thank you notes or calls. Goodie bags are not cheap and are unnecessary at a first birthday party, but if you’d like to send kids packing with presents, keep it simple. The little ones will be delighted with a mylar balloon (regular balloons are choking hazards). A pricier, developmentally appropriate gift is an egg shaker; pass out the shakers at the start of the party and the babies will have a ball! If bigger kids will be at the party, go to the dollar store and pick hair ribbons for girls and anything superhero themed for the boys. If you're planning far enough ahead, try an online novelty store - they're a great source of inexpensive and fun goodies for children over age three. Have fun - and enjoy your baby's Year Two!